So today I am finally taking a look at the new futuristic action/adventure bow shooter from Fast Travel Games Apex Construct. I have to say that I was really hyped to play this one as it has a lot of the things I look for in a VR experience. I love it when a VR game has such things as a building story, great graphics and solid gameplay and this one definitely has all of those. 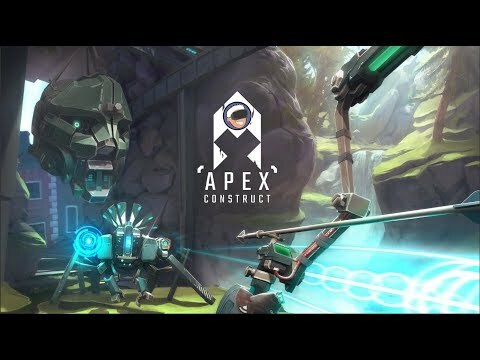 Overall I was impressed at first with Apex Construct but once I got into the game I noticed it had some glaring problems that made it seem a bit frustrating at times. When I first started it up I was very happy to see that Fast Travel Games had given the players the ability to use a free movement and rotation locomotion system... well that is until I couldn't even walk through the first door coming off the elevator. There are times in the game when the player is still forced to use teleport and while I do like it when the two locomotion systems are mixed in some games this one isn't one of them. Not being able to fit through a door or traverse over a 3 inch crack in the floor without having to resort to teleportation to get past things like this just felt wrong. The next issue that kept cropping up in Apex Construct was with the interaction systems in the game. Typing commands into the games CigDos OS on the computer terminal keyboards was a truly painful experience. Then there was the mixing of pointing with a cursor to select certain items at the vending machines but then having to press the buy button with my in game hands. This mixed style of interaction was needless to say a bit confusing... Why Fast Travel Games didn't just utilize the Touch controllers ability to reach out and touch these options is baffling to me? Aside from these issues the other thing that seems to keep occurring in the game were collider issues. I would often find myself walking through certain in game objects and even teleporting to areas of the map that should not have been accessible by the players. Now I know this seems a bit negative but I truly hope that Fast Travel Games will address these issues with this game because I have to say that if they were fixed Apex Construct would be up there with some of the great VR titles we have today! Overall I would still recommend this game to anyone who wants to play a descent story driven VR game but with the disclaimer to be aware that there will be certain things that are immersion breaking and somewhat frustrating!